Leaders of Los Angeles’s bid for the 2024 Olympics have released yet another batch of renderings detailing the sites where events would take place should the city succeed in its quest to host the games. The new images offer a closer look at the waterfront sports park in Long Beach that would host handball, water polo, BMX, sailing, marathon swimming, and triathlon events. Like the recently unveiled Valley Sports Park, the area would be given a brightly-colored makeover, with temporary facilities that could be easily disassembled after the games. 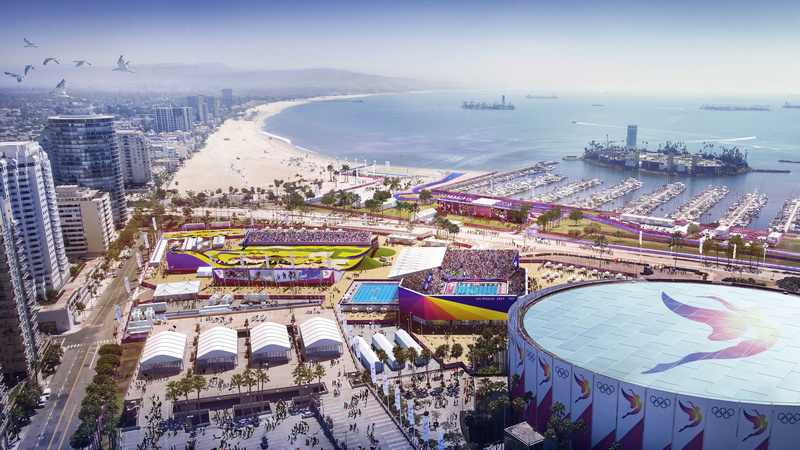 Such facilities are a centerpiece of bid committee LA 2024’s plans for the games, which would not require construction of any permanent venues—a strategy that bid leaders say will help the city avoid the financial losses that have plagued other games. The city’s plan for the games relies on four distinct sports parks located in Long Beach, Downtown LA, Carson, and the Sepulveda Basin Recreation Area. The sports parks would include a mix of live sports venues and food and entertainment options available to non-ticketed members of the public. Temporary facilities in Long Beach will be constructed for water polo and BMX, while the arena adjacent to the city’s convention center would house handball competition. Canals along the marina would be used for the swimming and triathlon events, while temporary seating off the pier would be set up as a viewing area for sailing. Along with Paris, LA is one of only two cities left in competition for the 2024 games, though International Olympic Committee officials have hinted that the losing city could be awarded the 2028 games. The IOC will officially decide on a host city in September.